When searching for new cookbooks, I definitely have a “type.” What I’m looking for has to contain ideas that are innovative and intriguing, the photography needs to be stunning and I have to believe in the author’s sincerity and passion through their writing and execution. As I opened Vegan Sandwiches Save the Day! by Celine Steen and Tamasin Noyes for the first time, I knew that this cookbook would not only satisfy all of this criteria, but would also fill a void I currently had in my cookbook collection—a compilation of recipes devoted exclusively to the creation and assembly of an underrepresented yet noble food item … the sandwich! If you are unsure as to why you would need a cookbook exclusively committed to the art of sandwich making, take a step back. Name five vegan sandwiches that are your “go to” sandwiches. (Daiya grilled cheese and PB&J don’t count!) Stumped? VSSTD contains more than 100 sandwich and sandwich-ish recipes, with unique and intriguing names and flavor combinations, like peanut butter banana bacon sandwiches, pan bagnat and portobello po’ boys. Currently on a gluten free diet? No problem. All VSSTD recipes that are or that can easily be made gluten free are clearly marked. Want to make your own bread? There are five stellar bread recipes included within. Short on time? Recipes that take 30 minutes or less are marked as well. Need to get your sandwich from point A to point B with no fuss? Sandwiches that are good for traveling are all conveniently indicated throughout the book. Celine and Tami have clearly thought of everything. How did you decide to come together to write a cookbook specifically about vegan sandwiches and what were some of your favorite aspects of putting the book together? Tami: Celine and I had been friends online for several years. We met through our blogs around 2007, if memory serves right, and were chatting back and forth via occasional emails and blog comments. I was antsy to start working on another book and thinking through favorite meals when I had the sandwich idea. I just floated it to Celine and was thrilled when she was as enthusiastic as I was! When we partnered up on VSSTD, Celine and I worked together seamlessly, to the point it was almost freaky. We’re both always open and eager to hearing each other’s ideas. Our strengths and weaknesses also complement each other quite well. For example, I have a knack for creating sandwiches based on seitan, tofu, and tempeh, where Celine is more at ease with vegetable-based fillings and baked goods. I think the fact we worked together so easily comes across in the book. Celine: For me, the most interesting and exciting thing about writing that cookbook beside developing the actual recipes was to build the list of potential recipes, making sure we’d have enough variation to please everyone, and also coming up with new concepts that haven’t already been done in other cookbooks. How was having a co-author different from working solo? Tami: Working with a partner is the absolute best. You’ve got a built-in sounding board, second brain, support system, and reality check. If any ideas fall short, two of us work on the improvements, which usually spurs other ideas, creating other recipes. It’s like rolling down a hill and so much fun! Some of my favorite recipes in this book are your Peanut Butter Banana Bacon Sandwiches and the Retro KFC-Style Sandwiches. How did you come up with amazing concoctions like these and what are some of your other favorite recipe in the book? Tami: I did the Retro KFC, which is a mock-chicken sandwich, with breading similar to KFCs. More than 30 years ago, we were eating at a KFC and I had their chicken sandwich. It was the last meat that I ever ate. When I took a bite, I had the realization that I was eating the flesh of another animal. I hated the idea that an animal had to die for me to survive and quit eating the sandwich (and all meat) then and there. Because of that, this vegan version of the sandwich holds a special place in my heart. I also really like the sandwiches that Celine and I worked on together, such as the Protein Happy Quinoa Wrap, which is a Mediterranean-inspired wrap, filled with seasoned quinoa, beans and fresh herbs. Oh, and being a romantic, the Jimwich, which is my husband’s signature sandwich, and his contribution to the book has to make the list. Celine: And I did the PBBB Sandwich. It’s really just a veganized version of the famous Elvis sandwich. When I first heard about this crazy flavor combo, I just had to try it, but I dreaded that the results would be the vilest thing ever. As it turns out, it couldn’t have been further from the truth: this one is definitely a favorite from the book, so all hail Elvis! Other favorites of mine include the From Russia With Love Sandwich (it’s a tempeh sandwich with beets, minced dill pickles and vegan sour cream, among other things), the Protein Happy Quinoa Wrap you’ve already heard about above, and the Deviled (Not) Egg Sandwich, packed with chickpeas, minced red bell pepper and other goodies. This cookbook has some of the most gorgeous and unique food photos I’ve ever seen. Can you describe your methodology behind shooting them? Celine: *Blush* Thank you for saying! I think the most important step for me is to start by building an approximate mental image of what I want the finished picture to look like, and select props accordingly by picking things that don’t clash, and that will work well with the sandwich’s shape, colors, etc. It can take quite a lot of sorting and tweaking before I get it right, so that’s probably what takes me the longest to prepare. After that, it’s just a matter of actually shooting the stuff, while hoping my cats don’t jump on the table and make a mess of everything. Can you explain how vegan sandwiches can actually save the day? Tami: You want the deeper answer, or the shallow one? In reality, eating vegan saves the day by being less harmful to animals, the planet, and your health. Big wins all around. On a lighter note, sandwiches always hit the spot! They’re quick, easy, and you get to eat with your hands! It’s hard to not to smile when you’ve got a sandwich in front of you. That saves the day for us. Thanks Tami and Celine! Now, on to the giveaway! Update: the giveaway winner is Cadry – congrats and thanks to all who entered! 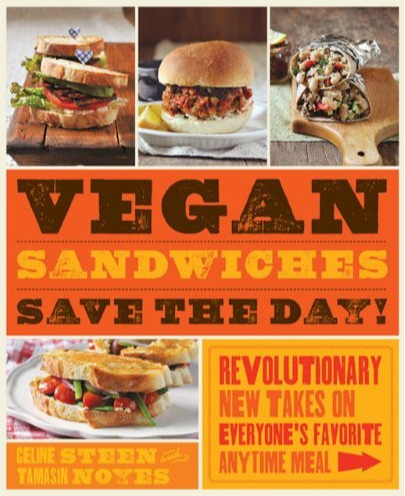 One lucky reader who comments on this post will receive a new copy of Vegan Sandwiches Save the Day! directly from the publisher. (Shipping is limited to US and Canada only.) To enter the giveaway, you may enter separate comments for any or all of the following to be entered into the drawing, and I will use random.org to choose the winner. All comment(s) should include some way to contact you in the case you are a giveaway winner. The giveaway will close at midnight on November 16 and the winner will be announced at 9 a.m. ET on November 17. Good luck! My fav sandwich is an ezekiel wrap with curried tofu, vegenaise, sriracha, avocado, and shredded carrots. My favorite sandwich is the reuben recipe from Vegan Diner. My "go to" sandwich is an avocado wrap with hummus, tomato, cucumber, beam sprouts (or spinach), walnuts and a sprinkle of balsamic dressing. I love it but am looking for some new ideas. This book looks wonderful, thanks the the great review! There is a vegan schwarma from The Vegan Table that I absolutely adore… SO GOOD. Tempeh glazed with soy and maple, wrapped up with cucumber and tomato, drizzled with a tahini sauce and some sriracha, rolled and tossed back in the pan to get nicely golden on the outside…. Oh baby. My favorite sandwich is the Better Than Tuna Salad sandwich from Colleen Patrick-Goudreau's cookbook. Thanks for the chance to win! I'm a big fan of vegan reubens. I may have a sauerkraut problem. My favourite sandwich is the big green sandwich from Thrive restaurant here in my city (an all-vegan restaurant). Avocado, jalapeno hummus, grilled zucchini, vegan garlic aioli, sprouts, and spinach on toasted organic 7-grain bread…. mmmmm… so good. My favorite sandwich is a vegan BLT! I love vegan reubens! I have had so many different versions and they are always great. I love a local bbq tempeh rollup with potatoes, carrots and sauerkraut. I love the sandwiches from the candle cafe cookbook. So many favorites! I love the Goodwich wraps from The American Vegetarian Cookbook from the Fit for Life Kitchen. My favorite sandwich is almond butter, banana, and cinnamon! My favorite sandwich is the Tofu Dill Salad sandwich from Vegan with a Vengeance. But I'm looking to expand my repertoire! My favorite sandwich is a vegan BLT with tempeh bacon, tomato, lettuce, and Veganaise, on rye bread. Yum! Currently my favorite sandwich is edamame hummus and tomato on toasted 7-grain bread…yumza! I would love a copy of the book! I'm terrible at making sandwiches. one side is a it's (starting from the bottom layer) bread, olive tapenade, guacamole, cucumber, tomatoes, sprouts, zucchini-hummus, bread. My favorite sandwich is grilled zucchini w/sun dried tomatoes, roasted red pepper, spinach, and toasted pine nuts. Good stuff, man, good stuff. My favourite sandwich was one I made recently had breaded tofu covered with a chipotle bbq sauce with a lime/vegenaise slaw on top, all in soft bun. So good! My favourite sandwich is the one I made recently with breaded tofu with chipotle bbq sauce and a lime/vegenaise slaw on top, all in a soft bun. So good! my favorite vegan sandwich is, hands down, a tempeh rueben….so so so so so so good!! I just tweeted the giveaway! Just posted about the giveaway on my Facebook. my favorite sandwich is a vegetarian bahn mi that i have yet to try to replicate at home. i'd love to receive this book! Right now I'm really digging the vegan Sloppy Joe recipe in Vegan Junk Food. Also, I shared the giveaway on FB (kelly.garbato). My favorite sandwich is a grilled portabella mushroom topped with grilled onion slices and avocado, on a sesame seed bun. i think my fave sandwich is Banh Mi, which is just a vietnamese sub. 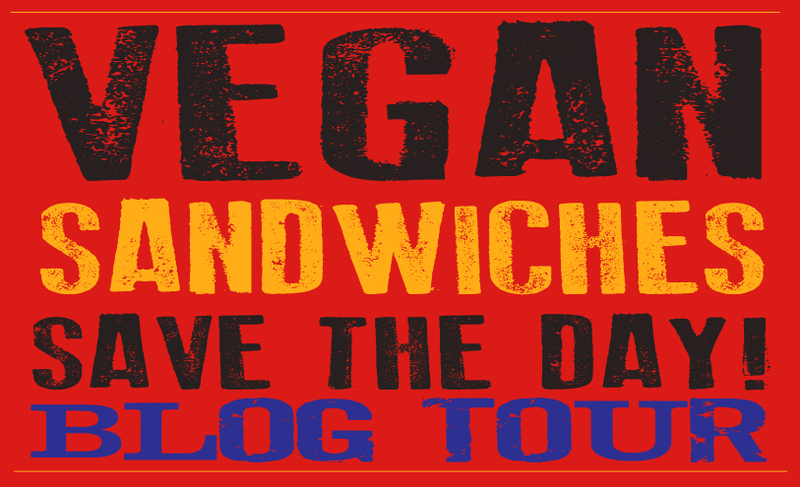 My favorite sandwich is the smoky miso tofu from Vegan Yum Yum on a roll with vegenaise, lettuce, and red onion. i think my favorite sandwich is a grilled un-cheese with tomato. i'll usually make up a thicker version of my standard cheezy sauce and then grill that on my iron skillet– bread thoroughly coated in EB, of course. also, i ran across your blog via theppk and i LOVE it. i have very similar food tastes and i'm eager to try out some of your awesome, creative recipes. Vegan with an omni partner and we DO NOT agree on sandwiches! Of course, my idea of a sandwich is grilled daiya with tempeh bacon so I clearly need help! The reuben from Cafe Flore in LA. Hands down! My favorite sandwich is a chickpea salad sandwich. I make it like I used to make tuna – purred chickpeas, vegan mayo, mustard, salt, pepper, onion powder and garlic powder – all mixed together! My favorite sandwich is a tofu salad sandwich, but I don't have a specific recipe because I haven't yet found one I don't like! My favorite sandwich is a grilled veggie panini. I love peanut butter and pickle sandwiches! My favorite sandwich is egg-less egg salad sandwich, but I don't have a good recipe for it yet. I had the best one in a restaurant and would love to make it at home. One of my favorite sandwiches is Peanut Butter, Vegenaise and Red Onion. Sounds so disgusting but its SO good! I love a good peanut butter and jelly (the key is good jelly and equally good bread!) Thanks so much for the giveaway! I LOVE a whole wheat pita stuffed with baby spinach, roast red pepper hummus, black olives, red onion and tomato slices! YUM! I discovered your blog during Vegan Mofo this year, and just want to tell you how awesome it is! One of my favorite sandwiches is BBQ soycurls + cole slaw in a wrap. I tweeted!! Thank you for the giveaway! I hear this is a sandwich – Berry Stuffed French Toast Pockets. Umm, yum!! I pinned on Pinterest! I pinned it. What a yummy book. This book looks great. I am always looking for a great sandwich recipe to fill even my bf's omnivore palate. Yum. My fav is smokey miso tofu with lettuce, vegenaise and tomatoes. Yum! My favorite is a grilled portabello with saurkraut and cooked kale and vegannaise. Anything with hummus! Mmmm… Tomatoes, kale, hummus, sesame seeds, roasted pepper and garlic, and olives on seed bread. Can't get any better than that! Vegan BLT for me! Nom nom nom! Looking forward to branching out a bit with this new cookbook! SO AWESOME!! I'm thrilled! This cookbook has been on my wish list for a while now. Can't wait to break into it! Thanks a bunch! I'm a vegan, so this cookbook would come in handy! My fav sammie is hummus with sourdought bread! this looks awesome! really want to try the rarebit recipe!